The bike handlebar mount with universal 1/4 inch screw can firmly attach your camera to bicycle handlebars, so you can record all the action while keeping your hands free. The removable suction cup mount is an essential gadget for camera taking photos or recording in the car. It can attach your camera to the smooth surface or the windshield as the picture. 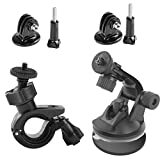 The suction cup pad is a good companion to the suction cup mount by providing a smooth surface to attach. With the double sided foam tape on the back, it can strong fasten to the smooth surface. The diameter of the pad is about 110mm. The tripod mount adapter can attach your quick-release ccbetter CS710 Waterproof Action Camera to any standard tripod with standard 1/4-20 triop stud fast and without fuss. Buy as a kit and save! This essential mount kit is ideal for using GoPro camera on the road. The bike handlebar mount can firmly attach your camera to bicycle handlebars and the removable suction cup mount can attach your GoPro camera to the smooth surface or the windshield in the car. The suction cup pad is a good companion to the suction cup mount by providing a smooth surface to attach. 2 pack tripod mount adapter and 2 pack long screw bolt are provided to connect your GoPro camera to the mount. The 180-degree swivel head of the mount for you adjust camera in any angels, it fits handlebar with about 20-30 mm diameter (adjustable). Easy to install and remove.